Growing up, I LOVED Poptarts. I would go months eating nothing but them for breakfast every single morning. This actually continued until I got to college and realized that a pack of two chocolate Poptarts contains 400 calories! That broke my addiction really quick. 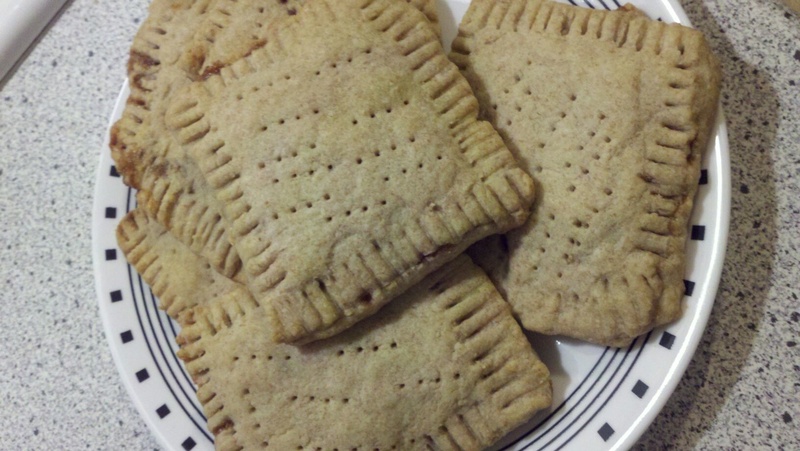 Nevertheless, when I came across a recipe for homemade Poptarts, I knew I had to try them. This variety is made with whole wheat flour and has a cinnamon sugar filling, so they are probably healthier than packaged poptarts. I actually made these a while back, but haven’t had a chance to do a post about them. They turned out really similar looking to store-bought Poptarts. Plus, they were delicious! These are a good food to make for breakfast when you have a bunch of people with different tastebuds eating. You can easily double (or triple!) the recipe and whip up a few different fillings for them and make everyone happy! For example, you could make cinnamon sugar filling, jam/jelly filling, chocolate filling…the list is endless! To make cinnamon filling: Whisk together the cinnamon, sugar, and flour. To make jam filling: Mix the jam with the cornstarch and water in a small saucepan. Bring the mixture to a boil and simmer, stirring, for 2 minutes. Remove from heat and set aside to cool. Make the dough: Whisk together the flour, sugar and salt. Work in the butter with your fingers until pea sized lumps are still visible, and the mixture holds together when you squeeze it. Whisk the first egg and milk together and stir them into the dough, mixing just until everything is cohesive, kneading briefly on a well-floured counter if necessary. Divide the dough in half, shape each half into a smooth rectangle about 3 x 5 inches. You can roll this out immediately or wrap each half in plastic and refrigerate up to 2 days. Assemble the tarts: If the dough has been chilled, remove from refrigerator and allow to soften and become workable, about 15-30 minutes. Place one piece on a lightly floured work surface, and roll it into a rectangle about 1/8 in thick, large enough so it can be trimmed to an even 9 x 12 inches. Repeat with the second piece of dough. Cut each piece of dough into thirds. You’ll form 6 3×4 inch rectangles. Beat the additional egg and brush it over the entire surface of 1st dough. This will be the inside of the tart; the egg is to help glue the lid on. PLace a heaping tablespoon of filling into the center of each rectangle, keeping a bare 1/2-inch perimeter around it. Place a second rectangle dough atop the first, using your fingertips to press firmly around the pocket of filling, sealing the dough well on all sides. Press the tines of a fork around all the edges of the rectangle. Repeat with remaining tarts. Gently place the tarts on a lightly greased or parchment-lined baking sheet. Prick the top of each tart multiple times with a fork; you want to make sure steam can escape or the tarts will become billowy pillows rather than flat toaster pastries. Refrigerate the tarts uncovered for 30 minutes while you preheat your oven to 350 degrees. Bake the tarts: remove the tarts from the fridge and bake them for 20-25 minutes, until they’re a light golden brown. Cool in pan on rack. I am totally making these soon. Thank you!! Let me know how they turn out! Thank you! Awesome! Let me know how they turn out! Thanks! I love the idea of a homemade poptart! These sound yummy! I am going to try to recreate the smore filling type. Any suggestions on ratio or marshmallow to chocolate filling. My teenagers will love it! I would say 2 to 1 chocolate to marshmallow (but I am a chocolate addict…) Thanks! The old pop tarts were known as pastries with pie filling and cinnamon filling, now there are so many flavors-the manufacturer really has gotten away from the original concept. Fruit or cinnamon filled are my favorite and made at home are so much better. You did a great job on these-Yum! Thank you! Poptarts are entirely out of control in my opinion…the only ones my family eats are the homemade ones. I love them!! Such a great idea…I have been wanting to try to make these at home for months. They look awesome! Thanks, you should try them. Definitely worth it. Sounds delicious… what a great idea. My sister LOVES poptarts (I personally don’t like them)… but THESE…. now these look like something I would eat… and like. a lot.